In the same 1968, when Alan Kay started to dream for his "personal computer for children of all ages", the famous manufacturer of electronic devices Hewlett-Packard Co. launched a programmable calculator, designed for scientists and engineers, who require complex calculations, which is probably the first device in the world, called "personal computer". It seems the earliest documented use of the term personal computer was in the October 4, 1968, issue of Science (Science is the academic journal of the American Association for the Advancement of Science and is considered one of the world's most prestigious scientific journals). The issue contains a Hewlett-Packard ad for its new HP 9100A, saying: "The new Hewlett-Packard 9100A personal computer, is ready, willing, and able ... to relieve you of waiting to get on the big computer... Ready to relieve you of waiting to get on the big computer... Willing to perform log and trig functions, even hyperbolics and coordinate transformations at the touch of a key. Able to take on roots of a fifth-degree polynomial, Bessel functions, elliptic integrals and regression analysis." Development of the Hewlett-Packard 9100A started in 1965 in Palo Alto, when a physicist named McMillian approached HP with a small calculator he invented. Tomas E. Osborne, another inventor, also approached HP with his own home-built calculator (when in 1971 the machine was patented (first application filed in 1966), namely Osborne was specified as inventor—see the US patent 3623156). 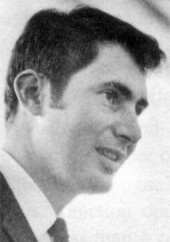 The best features of the two products were combined, and Osborne was hired as a consultant to continue the development work in HP Labs. The original size of the product was reduced by the invention of a PC board ROM by Chuck Near. The 9100A Desktop Computing Calculator (see the lower image) was introduced in March 1968. It was the first, totally self-contained programmable unit of its kind, which could fit on a desk (see the HP 9100A Brochure). It included a display with three registers and a magnetic card reader. An optional printer, which fit neatly on the top of the 9100A, was offered separately. The 9100A used a PC board ROM for its algorithms, including log and trig functions. Its volatile core memory used small ferrite rings through which were woven copper wires. The initial price of $4900 was rather steep, and it was later lowered to $4400. The 9100A was about the size and weight (18 kg) of a typewriter (see the Technical Description of HP 9100A). Programs and data were entered either through the 63-key keyboard or by means of wallet-sized magnetic cards capable of holding up to two complete read/write memory images. Data in the 9100A were represented as decimal floating-point numbers with two-digit exponents and twelve digits of mantiss precision. Results were displayed on a 5-in electrostatic CRT in three lines (numeric only), displaying the contents of three registers. Support was provided also for a full complement of arithmetic, logarithmic, exponential, trigonometric, hyperbolic, coordinate, memory, and programming functions. The speed of calculations was remarkable for the time—typical add/subtract operations completed in 2 ms, multiply required 22 ms, square-root 30 ms, and trigonometric functions 330 ms. Conditional and unconditional branching using flags and/or arithmetic comparisons were also provided, along with program halt, pause, and single-step execution. The 9100A's performance seems insignificant today with limited internal memory that stored only 196 steps. It was truly innovative for its time, however. It was organized into a 368-word by 6-bit read/write coincident current core memory for programs and data; a 64-word by 29-bit, 800 ns, threaded core ROM for control sequences; and 512-word by 64-bit program ROM for microcode. The latter memory utilized a 16-layer printed circuit board with inductive coupling to sense lines from reference and address lines. This unusual technology achieved a density of 1000 bits per square inch using no integrated circuits! 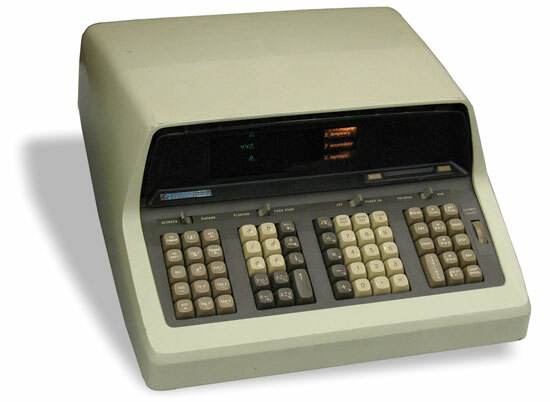 Although the HP 9100A was really a desktop computer (but yet specialized for scientific and engineering purposes), the company decided to sell it as a calculator, explains the HP corporate archivist. "At the time, the perception was that a computer had to be big to be accepted by the market," she says. Calculators were also more likely to be bought than computers, she adds. Purchasing agents were authorized to buy calculators, whereas computers required top management participation, regardless of the cost. "If we had called it a computer, it would have been rejected by our customer's computer gurus because it didn't look like an IBM. We, therefore, decided to call it a calculator and all such nonsense disappeared." Hewlett-Packard soon followed up with the 9100B, an enhanced version that provided several new features. In 1972 HP introduced the HP 9830A—the most powerful model of the original 9800 series calculators. It greatly blurred the lines between traditional computers and calculators due in part to its use of the BASIC programming language and options such as terminal emulation and a hard disk drive.